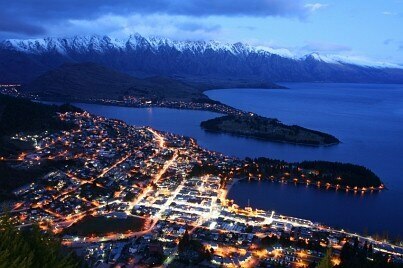 Situated in the verdant southwest of the South Island, Queenstown is the adventure capital of New Zealand. It sits on the banks of Lake Wakatipu, one of New Zealand's largest bodies of water, and provides access to the country's best national parks and stunning wine and ski regions. Queenstown itself is a mixture of high-energy party streets and quiet suburban enclaves, while just outside of the town, accommodation options provide great links with the Otago back country and the region’s major natural attractions. Whatever you’re after from your accommodation in Queenstown you’re sure to find something that fits. Quirky art culture and high-end postmodernism are the somewhat mismatched hallmarks of Queenstown’s thriving souvenir and craft scene, while the shopping mall retail park that features in the town centre and nearby Frankton district have ensured that even those looking for high street stores in this mountain setting won’t be disappointed. Amidst the tight-knit streets of downtown Queenstown, where the untameable energy of the city’s thrill-seeking adventure demographic seeps unceasingly into the nightlife party venues, there’s also a real variety of culinary gems to discover. Serving everything from home-grown New Zealand traditionals to Mediterranean fusion and east-coast surf and turf, there’s something on the menu for everyone, while those coming specifically to unravel the culinary delights of South Island are sure to leave with a grin. With such a plethora of adventure travel on its doorstep, Queenstown itineraries are predictably awash with the tastes of adrenaline and energy. ‘The great outdoors’ comes part and parcel to any trip here, while some of the more refined New Zealand activities, from wine tasting to scenic excursions, are always reassuringly close to hand. Framed by the aptly-named Remarkables Mountains and nestled next to the pristine waters of Lake Wakatipu, the iconic all year resort has become the most coveted adventure destination in New Zealand. Today adrenaline junkies arrive in search of Queenstown’s seemingly boundless offering of outdoorsy pursuits, while the patchwork of craggy limestone canyons, superlative wine country, gushing rivers and former goldrush towns, make this one a veritable bucket-list regular. Like any medium-sized New Zealand town, Queenstown is nice and compact and all shopping areas are readily accessible on foot. Most of the action is downtown, which is charming and nice for ambling about. The shopping here can be quite pricy; a testament of the quality as opposed to taking advantage of tourists. Queenstown is largely devoid of traditional landmarks and period buildings, with most of the allure coming from the beautiful natural surroundings and the genuine feel of the place. Although not right in the town, Bob's Peak and The Remarkables mountain ranges are musts to gain a perspective over the town. The ‘Adventure Capital of the World' is all about the outdoors and extreme sports. AJ Hackett set up the world's first bungee jump in Queenstown and the place has continued the theme to also offer whitewater rafting, jet-boating, hiking, mountain biking, and so-called Fly By Wire. Queenstown is well turned out with an excellent tourist infrastructure and hospitality; good transport options, and some of the most accessible, high quality shopping and dining in the country. It is also a safe town, save the extreme sports, yet reading up on the place for tips on weather and transport will make your stay more rewarding. Queenstown has a fantastic selection of restaurants for such a small town and every where is virtually within walking distance. There are well over 100 eateries here with choice of food going from the very best New Zealand lamb and seafood, to Pan-Asian cuisine, Middle Eastern snacks, fine French and Italian food, and the best of British.